Born in Santander, Spain in 1954, he first exhibited in New York in 1989 at the Farideh Cadot Gallery. This will be his third presentation at Cheim & Read. He lives and works in New York City and in Santander, Spain. Featured in the new exhibition are a group of large black paintings collectively referred to as "Soñe que Revelabas." Literally translated "Soñe que" means "I dreamt that you" and "Revelabas" is a photographic term referring to the appearance of an image when printing in a darkroom. A group of these were recently shown at the Museu Serralves/Museu de Arte Contemporanea, Porto, Portugal. 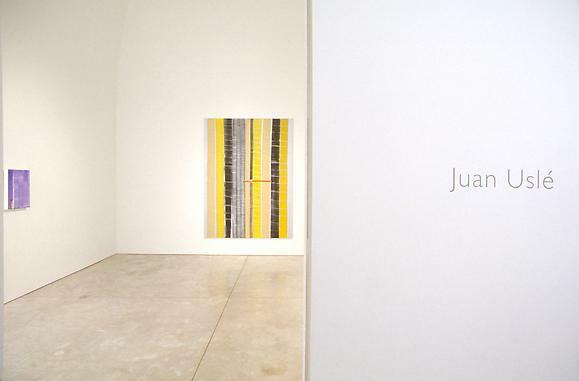 About Juan Usle's work, the critic, Dominique Nahas said "The most evident quality of Usle's work is its freshness and spontaneity. Intermixed within each painting's highly sophisticated format is an utter lack of contrivance. The painter's work has a dual sense of urgency as well play and forthright elegance that is hard to miss. The light and fluidity that are two of the hallmarks of his work continually bear upon a discursive gridwork, whose pictorially woven components are always shot through with layers of often–ambiguous connections to line and color. The quality of play in Usle's paintings is felt through its animated proliferation, its indirection, its fluidity and slippage. It will not be difficult to think of the overlaid/interlaid network lines in each work as referring to social sites of some kind. The relation of sites to other sites seems to inform Usle's paintings, if we follow Michel Foucalt's argument that, in the social matrix, site has been substituted by extension, which had itself replaced the concept of implacement. Our epoch, he claims, is one in which space for us takes the form of relations between sites, between nodal points of connections. It's easy to see Usle's evident intention to give us visual histories of social fabrics, sites that have been torn, shredded, fragmented, and sometimes mended or patched to create a more vibrant and stronger piece of material with all of its fault lines open to view. Usle is remarkably sensitive in making near-agonistic references in his work to loss, distance and aloneness which comes out of nomad territories. Vagabondage has its own sense of terror as well as exhilaration, his work seems to be saying. Finally, what is so strongly felt and moving in Usle's opulent work is the sadness that drifts in and out of its high-spiritedness."